We had a mostly free Saturday, and the girls wanted to go out and do something with me. We ended up deciding to go ice skating. Yes, our ice rink is open in August. So, we escaped the heat for some frozen fun. Note that while it was cold, it wasn’t that cold. I took off my jacket and skated in jeans and a t-shirt. Leah eventually took off her jacket (though not her gloves or scarf), but Molly refused to remove her winter-wear. The girls and I had a great time. 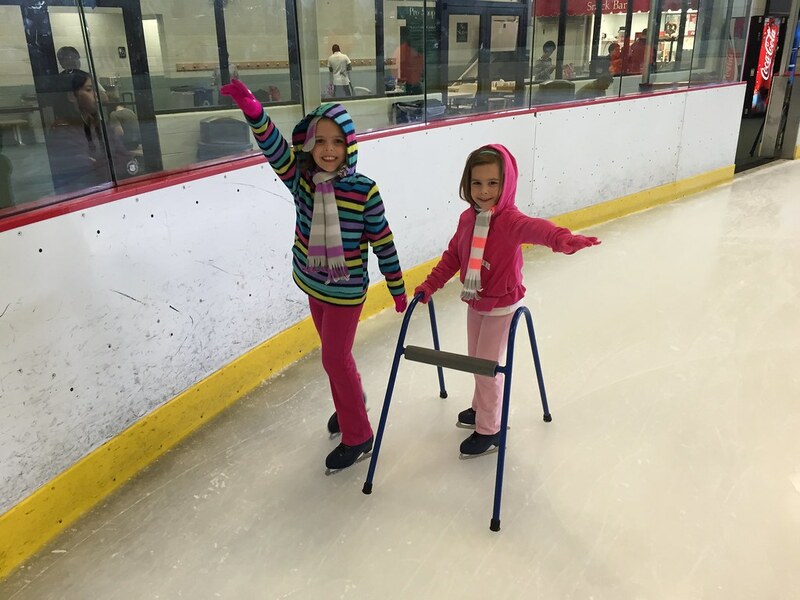 Molly skated on her own the entire time, while Leah switched between using the walker and holding my hand. Leah may have needed some support, but that didn’t slow her down. She went around so fast I could hardly keep up. Our time on the ice was grand, but it was not enough frozen fun for us. So, we made a quick stop at Yogi Castle for a chilly treat. Between the ice rink and the fro-yo, we certainly beat the heat. 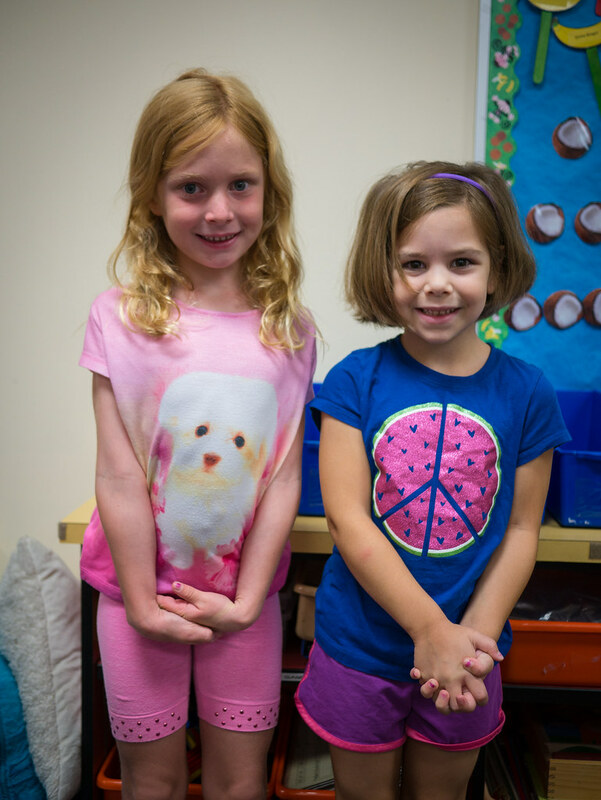 Molly and Leah spent a week in August learning about 3-D crafts at the Howard County Arts Council. The week’s projects included creating a plaster bird, and designing and sewing a plush monster. 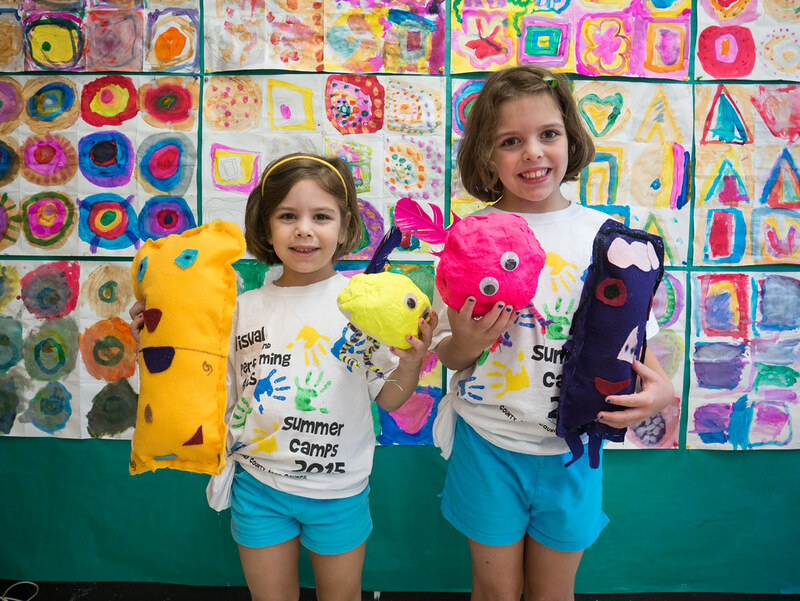 Both girls love arts & crafts, so they had a fantastic week in camp together! The girls made their own Fat Quarter skirts. 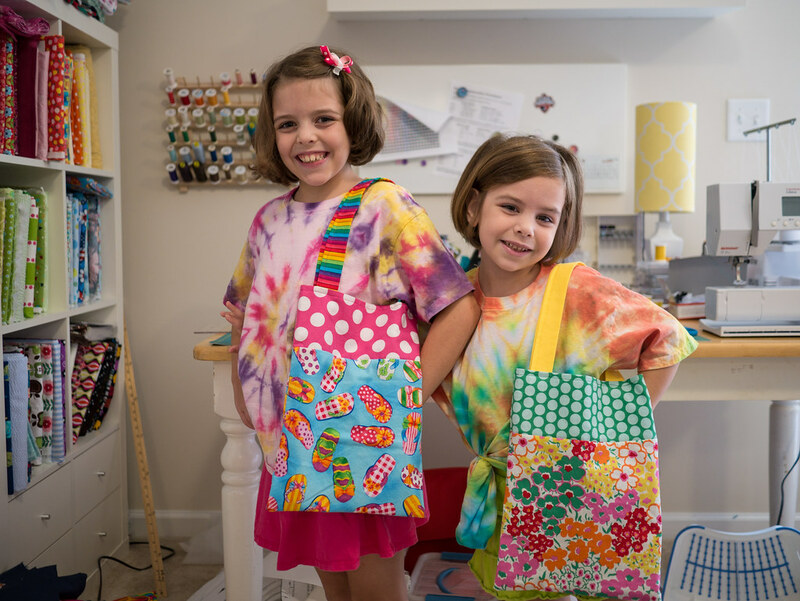 They decided it was best to model along with their tote bags from the previous week. 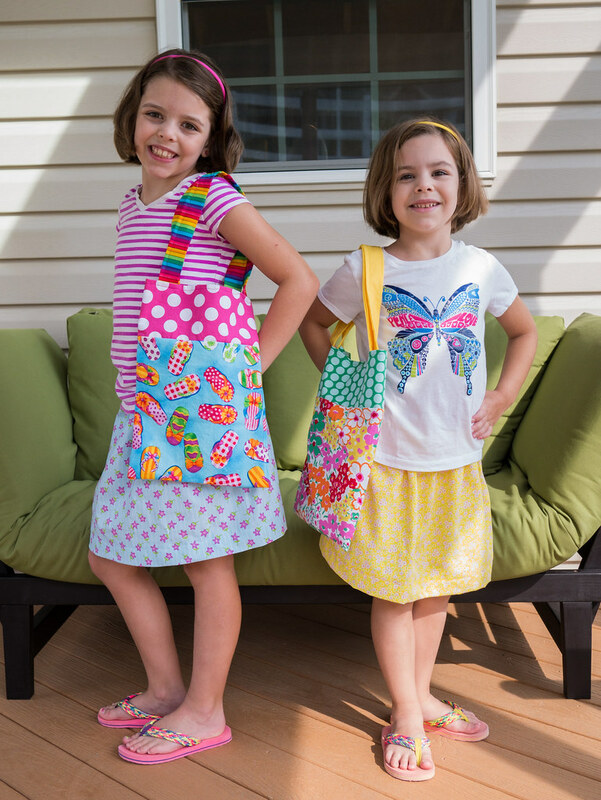 Making these skirts with the girls required a lot more assistance with ironing and inserting elastic, so no additional action shots from this lesson. 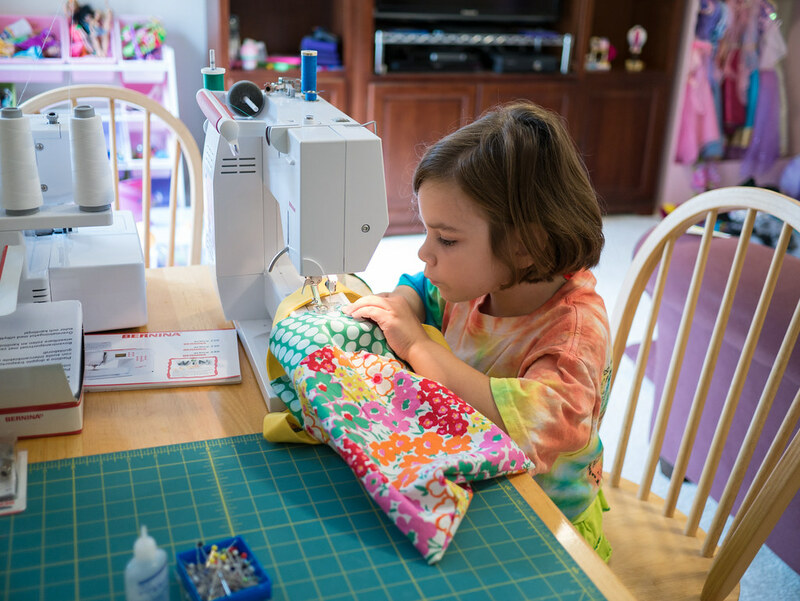 Molly has really enjoyed learning to sew. She needs help some of the time, but I can give her basic directions and she takes off. 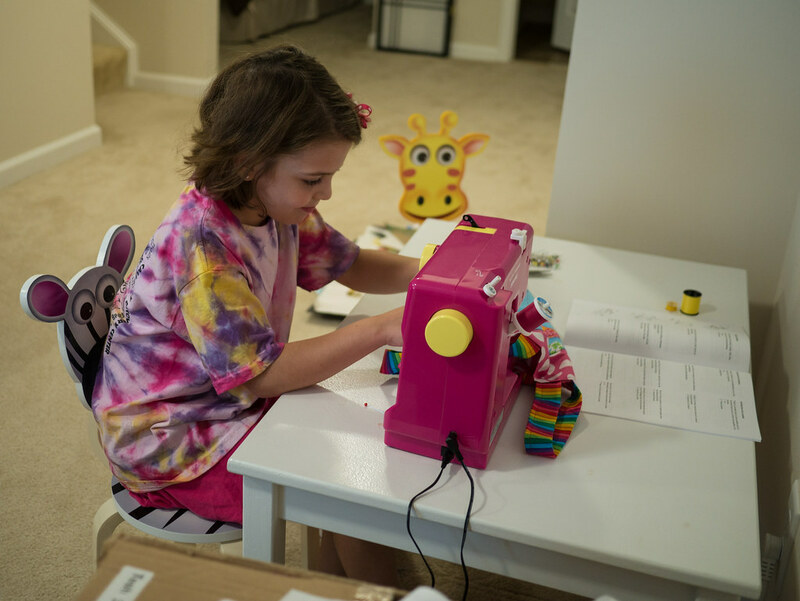 Leah is a very patient seamstress. She’s slow and steady, which is great for achieving straight lines! Yes, the day has come. 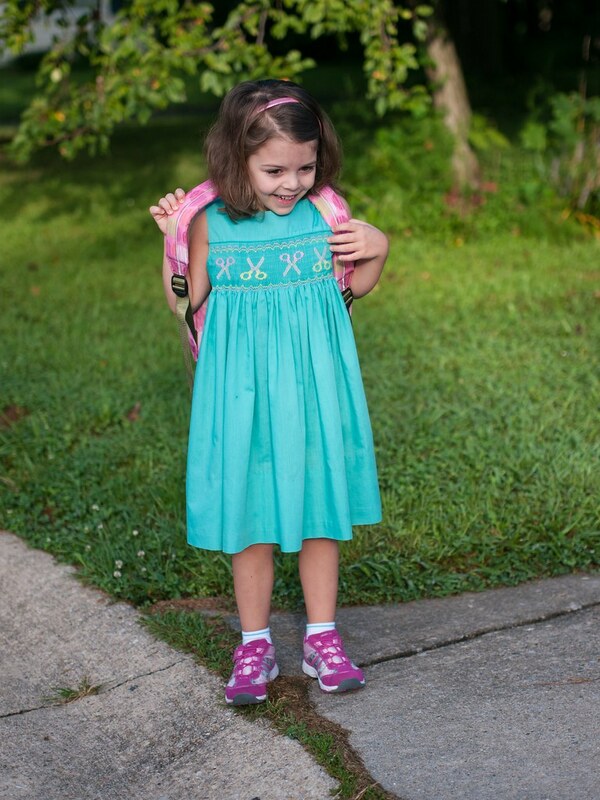 Yesterday, Leah headed off to kindergarten. 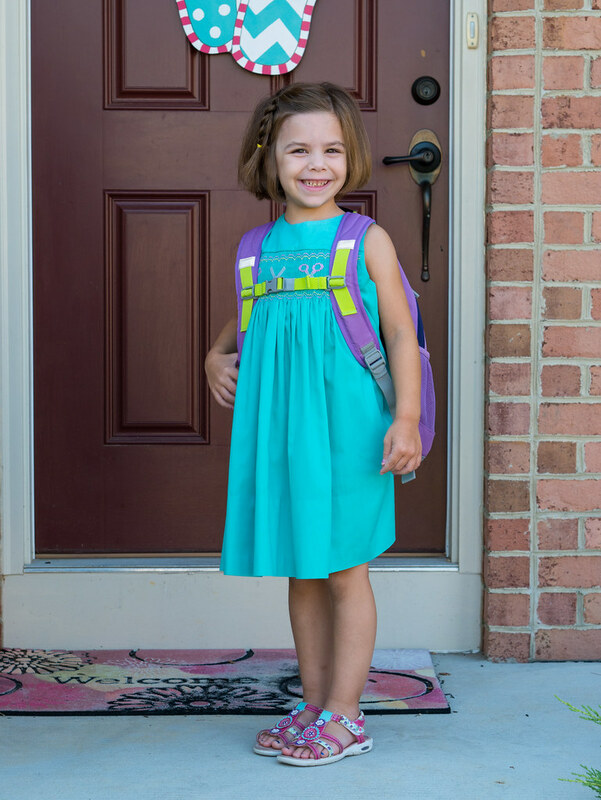 No longer a preschooler, she now joins her sister in elementary school. Molly’s now an old pro, headed off to third grade. She’s wearing a skirt that Jen made for her this weekend. 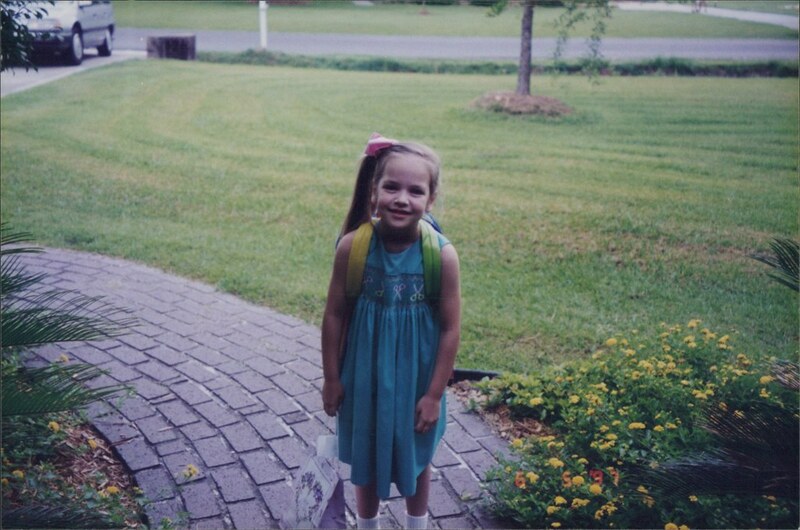 Grams made this dress for Aunt Caroline’s first day of kindergarten. Molly wore it her first day of kindergarten as well. Now Leah is wearing it her first day of kindergarten. The smocking plate is even called Kindergarten Scissors. Here’s Molly wearing it 3 years ago. And Aunt Caroline wearing it 19 years ago. 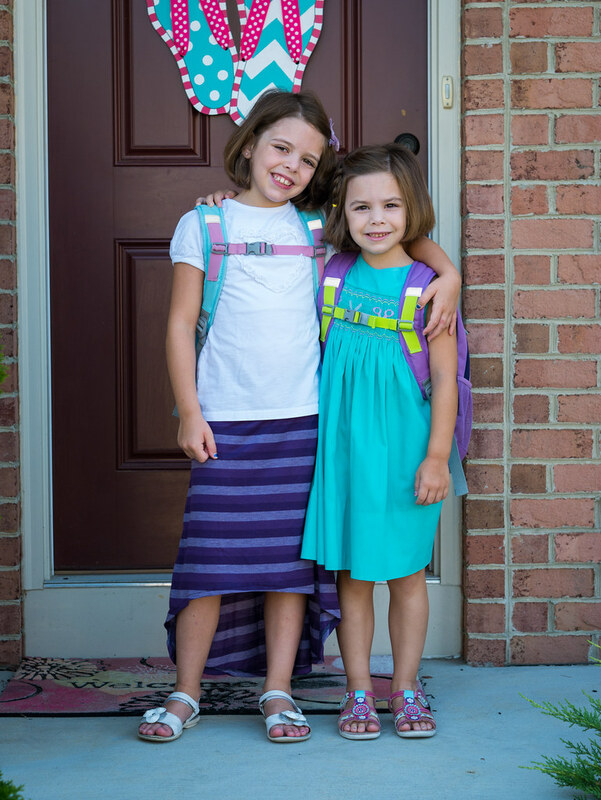 I know that lots of kids dread the start of school, but these girls are definitely not like them. They’re very excited to get back in the classroom. 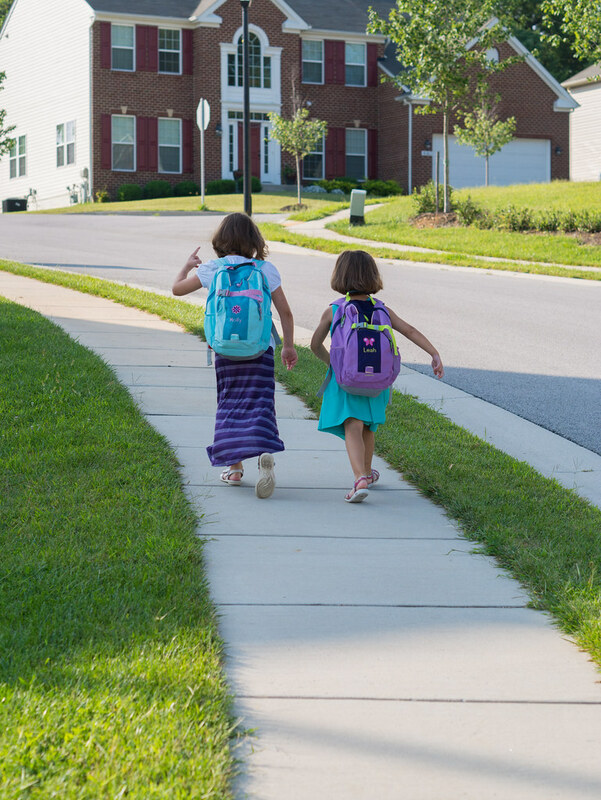 Two sisters, walking to school together for the first time. 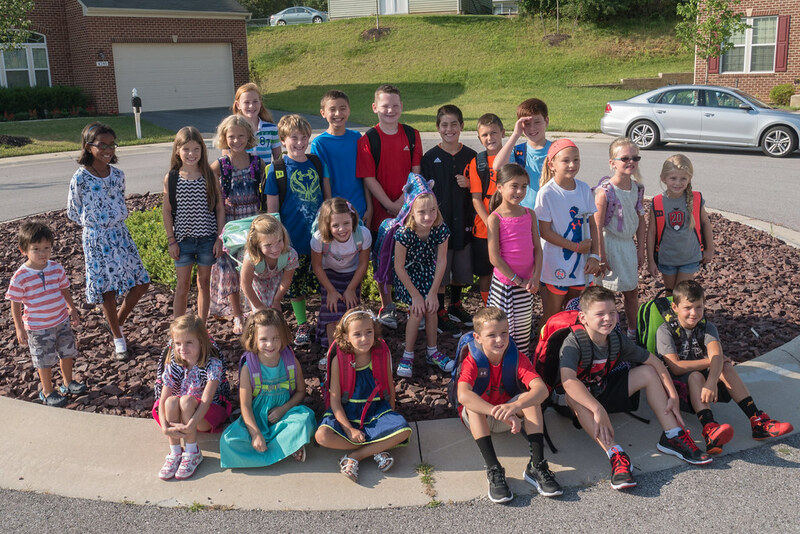 As usual, the neighborhood kids gathered for a picture on the walk to school. 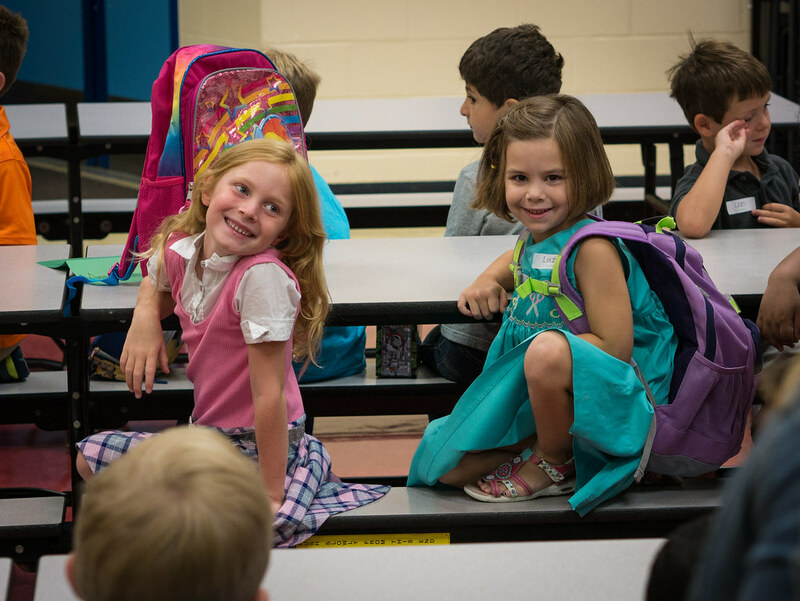 While many of the kindergartners were crying at drop off, Leah and her new friend were happy to start the day. 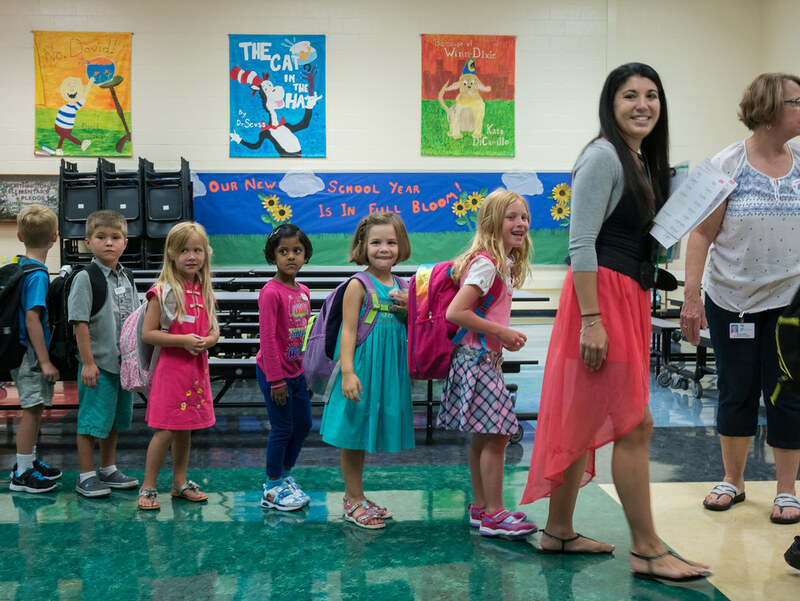 Kindergartners lined up and following their teacher to their classroom. Both girls had an excellent first day, exiting the school with big smiles on their faces at the end of the day. We’re looking forward to a great school year. Friday, the girls had each got to go to school for a Sneak a Peek to meet their teachers and some of their new classmates and tour their new classrooms. First up was Leah. Yes, Leah is headed to kindergarten. 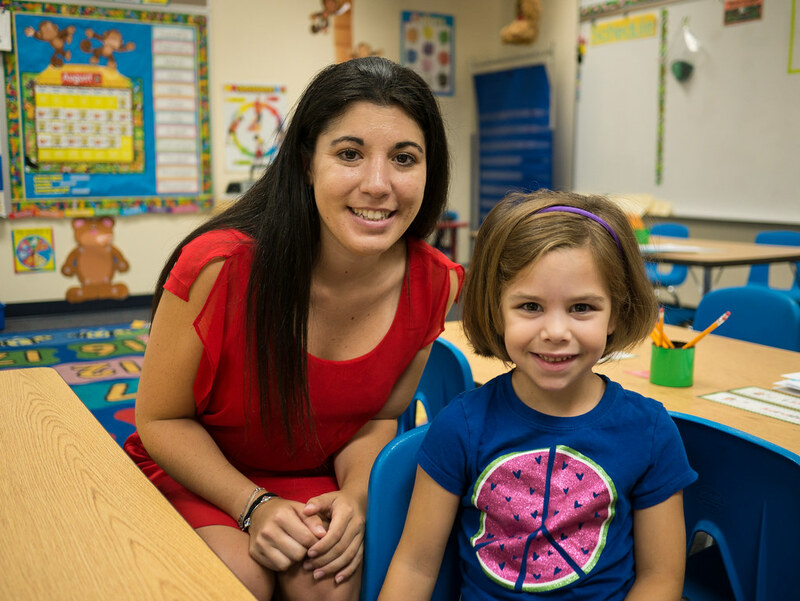 Here’s Leah with her Kindergarten teacher, Miss Leotta. She’s been ready to start Kindergarten since we signed her up in March and now it’s finally here! Leah was excited to make a new friend in her Kindergarten class. The best part is that they share a birthday! 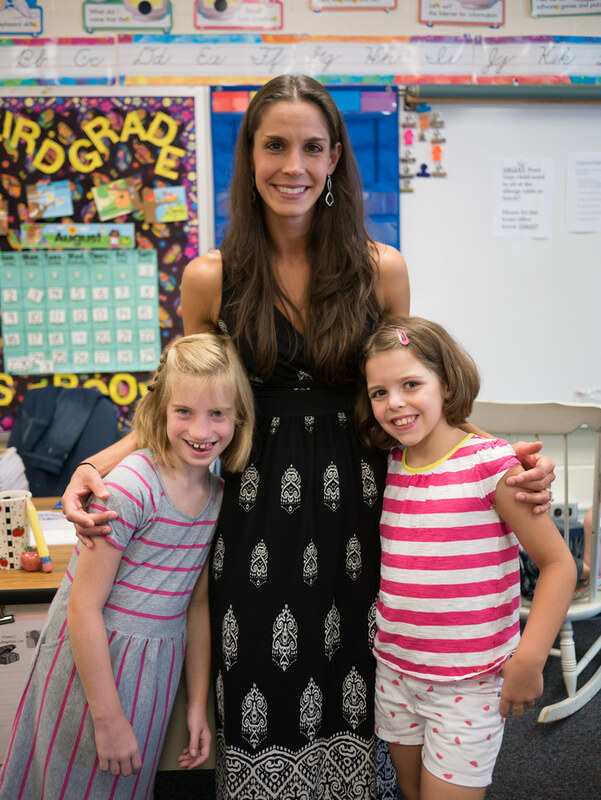 3rd Grade in Mrs. Wanex’s class will be super fun since Jordan and Molly are in the same class for the third year. Back in March, when Molly opened her birthday card from Aunt EA and Uncle Scott, I was recording her. Aunt EA and Uncle Scott are known for giving fun singing cards that the girls love, so I wanted to capture their reaction. Little did I know that there was a bit more of a surprise than we were expecting. I wasn't allowed to share this video at the time, but I thought I'd go back and do so now. Yes, we’re expecting a nephew around Thanksgiving, and this is how my sister told us about it. I wish I had kept recording, but I was so shocked I immediately hit stop. In case you couldn’t guess it, Jen’s next word was “way”. We arrived at Grammy’s place and immediately ate lunch. We hung out for a while chatting (and doing a bit of tech support) before checking into our hotel. 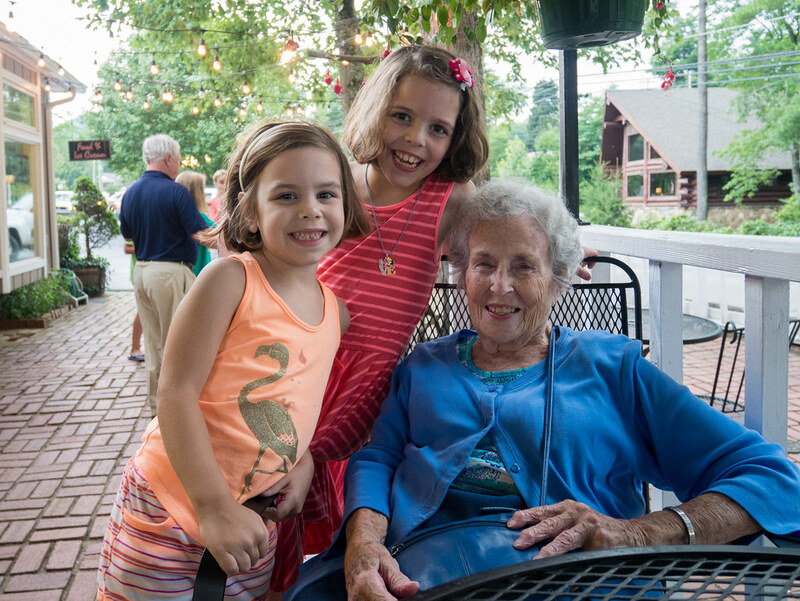 Then Grammy took us out for dinner and ice cream. The next day, after going out to lunch, we headed to a playground. The girls played for a while, but were tempted by the pool next to the playground. So, we eventually changed into our swimsuits and the girls and I swam while Jen and Grammy chatted. 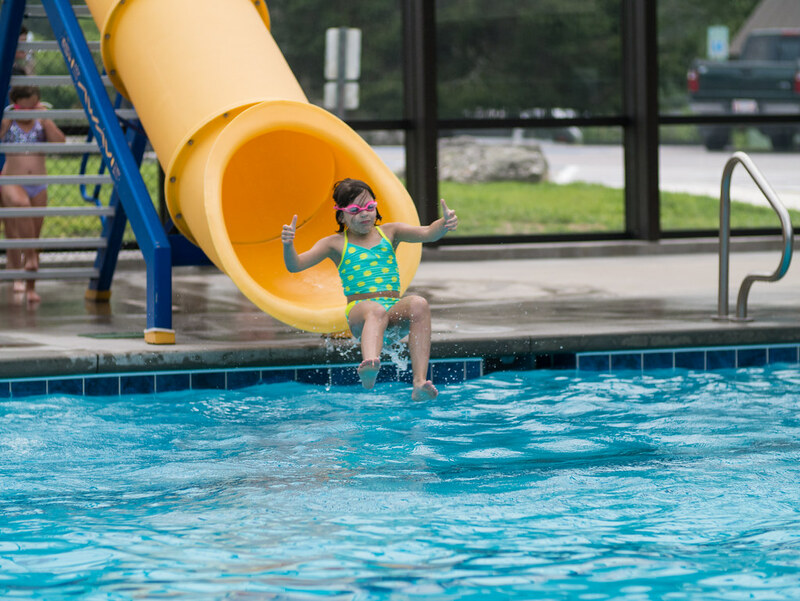 The pool had recently received some fancy upgrades including a retractable roof and this fun water slide. After passing a deep water test, Molly was allowed to use the slide (over and over). It wasn’t huge, but it was fast and shot you out so you almost skipped along the water. Thumbs up, Molly! After some baths, we headed to a pizza place for dinner. 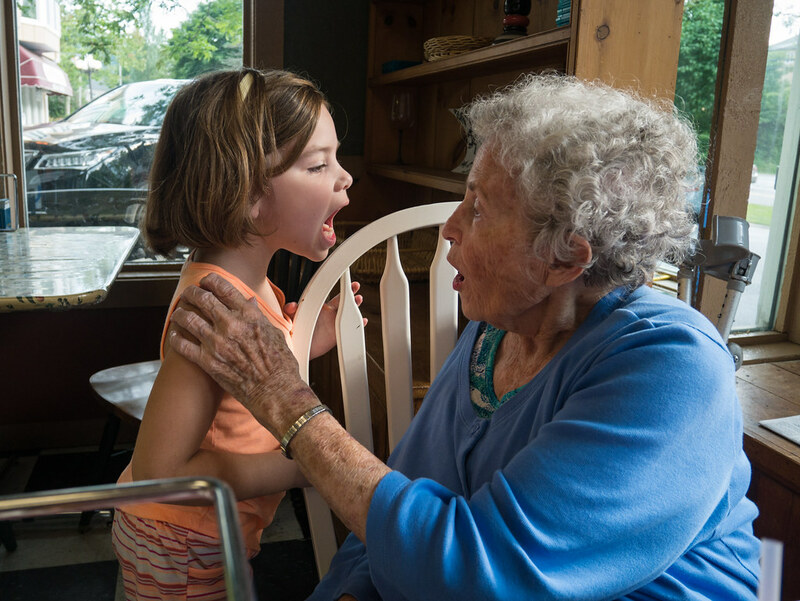 While we waited for our food, Leah made sure to show Grammy her lost tooth. Grammy took us to a fantastic ice cream shop called SweetTreats both evenings, which the girls loved. They let you create your own flavors, then sit outside to enjoy the delicious treat. Thanks, Grammy! After a couple days in Highlands and just under two weeks on the road, it was finally time to head home. The 11 hour drive home was uneventful (and included a delicious lunch at Zaxby’s). And then we finally got to sleep in our own beds again. The drive to Highlands was only about 4 hours long, but that doesn’t mean nothing worth writing about happened. On the way to Highlands, we needed to make a bathroom break. 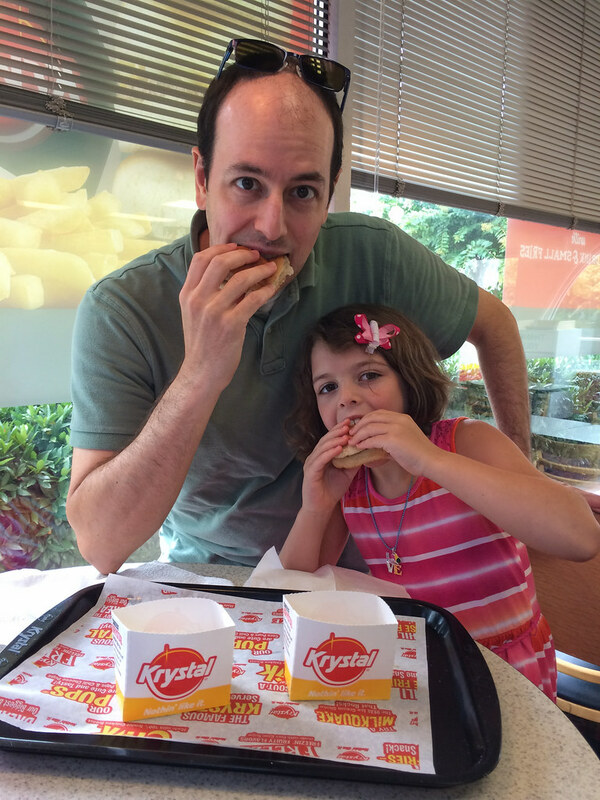 When we discovered the rest stop was closed, we were forced to stop at one of my old favorite places that does not exist in Maryland - Krystal. And since we were going to have a late lunch in Highlands and Krystal’s burgers are so tiny, it seemed only prudent to have one to tide us over. As we got closer to Highlands, Jen glanced back to find this in the backseat. 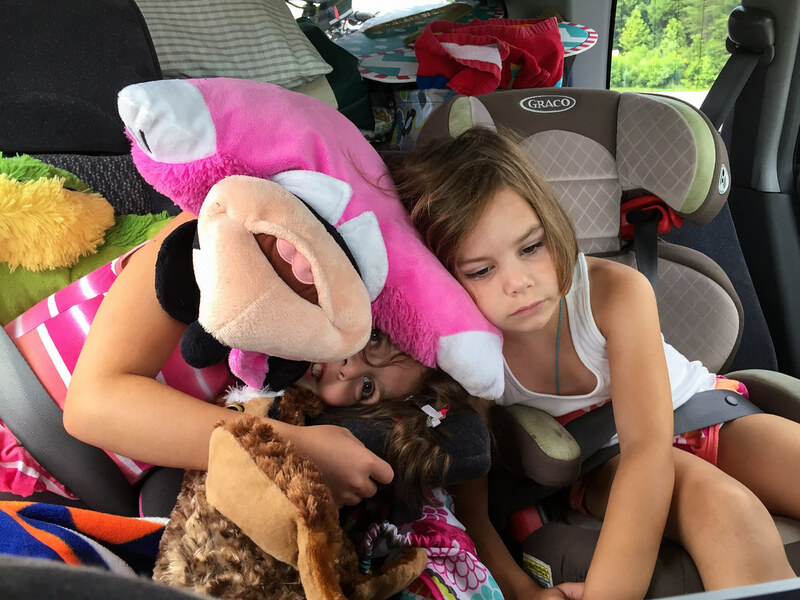 These girls were troopers on all these travels. 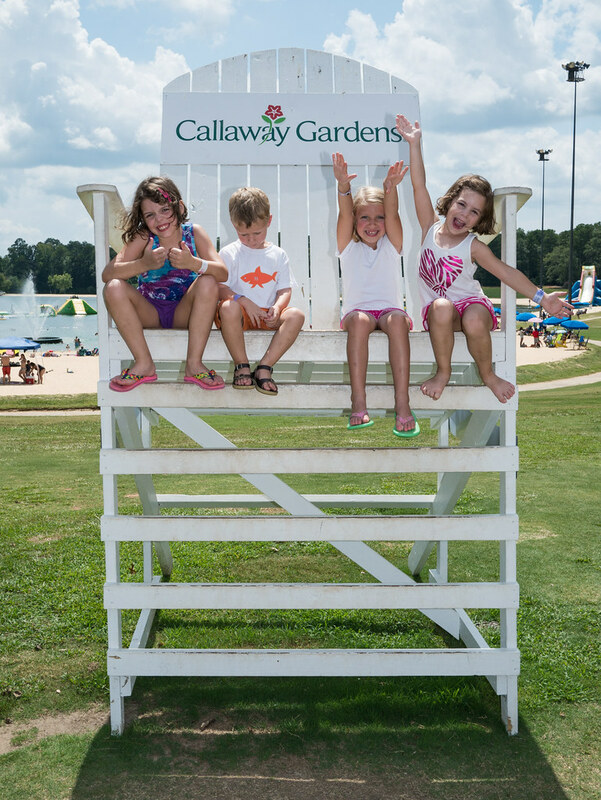 After the last day of camp, we made sure to take a picture of the kids in the giant chair near the beach. (Don’t ask why they have a giant chair. Just accept that it’s awesome.) Here you can see a whole spectrum of emotions. Now one with everybody. Everyone was happy to be taking this picture, as you can see. The week was so much fun, but it eventually had to come to an end. Saturday morning it was time to leave. 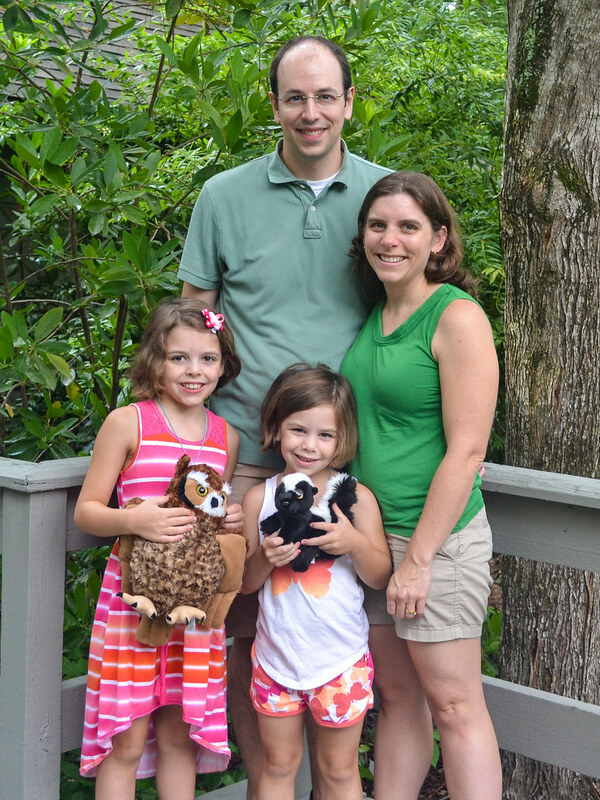 Before hopping in the car, we took a picture of the four of us (and a couple of new stuffed animals). I believe this may have been the only picture of the four of us from the entire week. 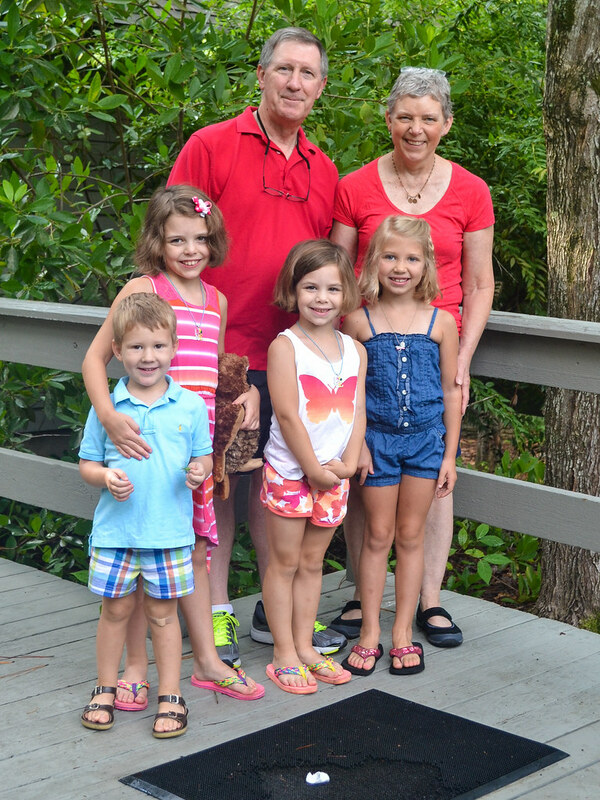 Thanks G’Mom and Grampa for an awesome week! 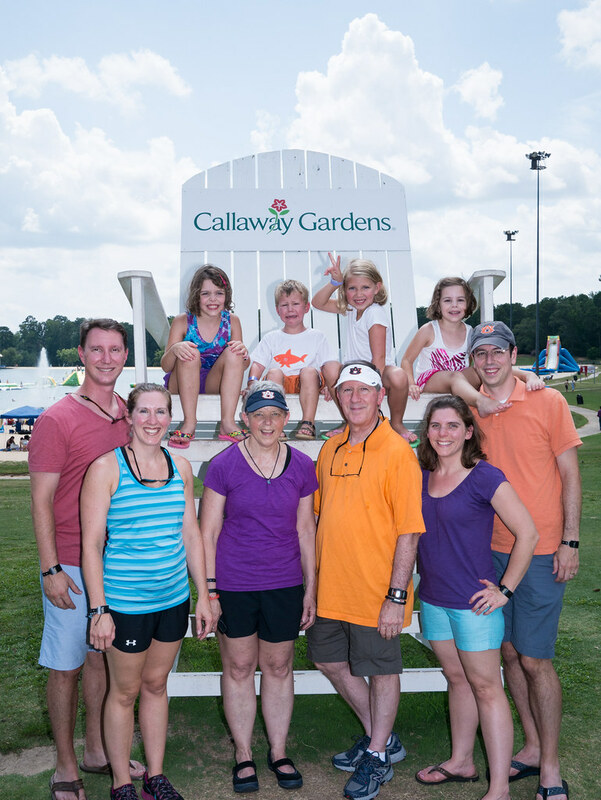 That was the end of our time in Callaway Gardens, but not the end of our trip. Everyone else was headed home, but we still had another destination before that. Next stop - Highlands, North Carolina to visit Grammy.